I think that all children should have lots of blocks! It is really the only toy they need with their imagination as the only limitation. Just like sewing clothes for my babies, I always envisioned I would make wooden blocks for them. We have made some [amazon_link id=”B003BWVJ72″ target=”_blank” ]Citiblocs [/amazon_link] style blocks to expand the set we were sent for review. What I envisioned was more what I have just discovered from a new toy company that thanks to Kickstarter is in business! Larsen Toy Lab is founded on the idea of creating a book series and puzzles, around wooden blocks to promote critical thinking. I am so excited about these toys! Our idea for Larsen Toy Lab is a simple one, and it stems from a frustration of seeing the same cheap plastic imported toys on every shelf and every online shop. With our combined experience in Product Design, Engineering, Marketing, and Sales we felt like we were in a position to do something about it – and after talking with friends and family it was clear that our toy pain was shared! We were sent a Building Bridges set with my son’s name lovingly engraved on. He was so excited to see this personal touch. The blocks feel heavy since they are made of real quality wood. They come in unique sizes and shapes compared to standard unit blocks. These unique sizes are great for assembling ideas in the stories as well as extending existing block collections towards more creativity. 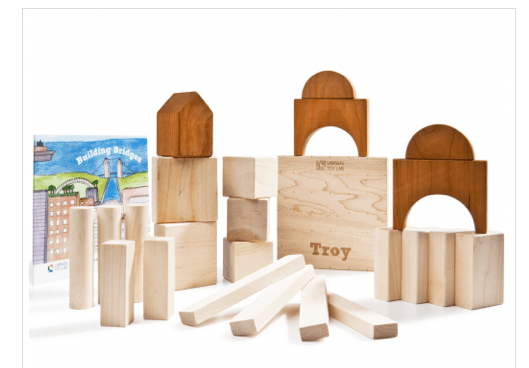 Building Bridges block set and matching children’s book aims to add another educational layer to the vital learning experience that block play offers. In the 2nd installment of the series Leif continues his adventures in a new city making new friends (his classmate Emma) and facing new challenges. The set includes Cherry blocks that have a light beeswax finish and Maple blocks that have no finish at all. As always, our blocks are all-natural, hand-sanded, individually beveled, meet ASTM F963-08 safety standards, and always American Made! I absolutely love the connection between literacy and block building espoused by Larsen Toy Lab. Challenging children to build the images from the book truly helps build mental development. There’s a reason blocks are included on any educational psychological testing. As part of the grand opening of Larsen Toy Lab, you can get 15% using the code 15GRAND at checkout, in addition to free name engraving. I think the Larsens have really figured it out, and I wish them the best of luck! Please support them. You will not be disappointed. Great to see that they got their funding and are up and running! No need to think twice when purchasing wooden toys for you kid. Wooden toys are not just another type of toys, they are poles apart from plastic toys in terms of increasing creativity. According to one of the survey’s, kids had choosen wooden toys over plastic. The reason for that as they give them a sense of personal touch. Just now I’m thinking, how much effort is required by those wooden toy manufacturer’s to create a masterpiece for the future generations.